Our CrossFit Aevitas family is full of the most amazing people! In honor of Mother’s Day, this Aevitas Athlete Spotlight is all about superstar mother-daughter athletes Judy and Abriana Cahee. If you don’t know Judy and Abby yet, this should give you a peek into who they are, and why we decided to spotlight them! Even if you already know them, keep reading - you might learn something that you didn’t know before! Q: Judy, please tell us a little about yourself (where did you grow up? where do you live now? family? what you do for a living? etc). Judy: I’m originally from West Rutland, Vermont. I moved to the area to obtain a Masters of Taxation degree at UAlbany. While attending grad school, I worked as a tax intern at a local CPA firm and remain at that firm today. I reside in Guilderland with my husband of 23 years, Bob, and two children, both of which frequent CrossFit Aevitas. Q: Abby, what about you? Can you tell us what grade you are in, and what you like to do for fun (besides CrossFit)? Abby: I am in 8th grade at FMS. What I like to do for fun is playing with my year old puppy Gizzy. Q: What was your experience level with athletics/sports prior to CrossFit? Judy: Not much! Occasionally, I would train for and run a half marathon, workout with T25 or use an elliptical. Nothing consistent. Abby: Before this I danced for ten years and did acro for two years. 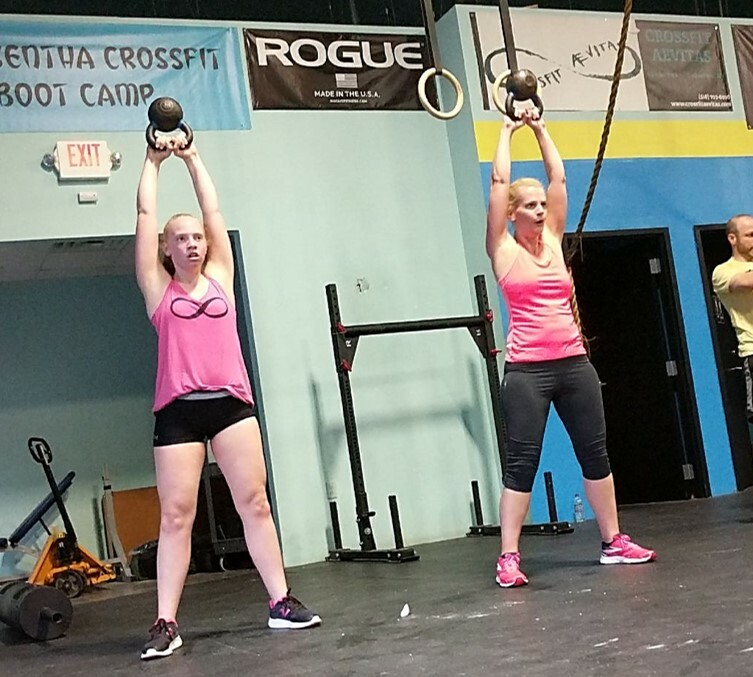 Judy: My favorite part about CrossFit is the accomplishment felt after a challenging workout or getting a PR and my favorite part about CrossFit Aevitas is the people. It's an encouraging environment to workout in and people are respectful. Abby: My favorite thing about CrossFit Aevitas is how nice the people are there. My favorite thing about CrossFit is how many scaling options there are to choose from. Judy: My favorite movement is box jumps. Probably because of the feeling of accomplishment since the first time I tried to jump on a box, I couldn't do it and it took some time to jump 20”. Abby: My favorite movement is overhead squat because of how challenging it is. Judy: I'm not a fan of overhead squats but it's fun to go when they are in the workout now because Abby loves them and excels at them. Abby: My least favorite movement is box jumps because I don't like the feeling of how you might fall. Q: What is the best part about working out together? Joint answer: We both are competitive so it's fun to workout together because we push ourselves more. Q: Who would win a Crossfit competition between the two of you? Judy: Abby- I’m more than three times her age and she has incredible flexibility and strength! Tonight she did a 200# yolk carry! Abby: I think it would be a tie because we both have our strengths and weaknesses. Q: Do you have a specific gymnastics movement/lifting goal you are chasing? Judy: I’d like to deadlift 200lbs. Judy: Not only my strength, but my overall fitness has improved. Burpees were awful. I couldn't climb the rope or jump on a 12” box. Abby: Since I have joined CrossFit I have improved on running because that was a struggle of mine. Thanks for taking the time to answer our questions, girls! Athletes - keep an eye out for your turn to be in the Aevitas Athlete Spotlight!